This is a proven, complete step-by-step digital (plus “in-person”) training course that walks you through exactly how to find, analyze, buy, renovate, and sell/lease real estate (with focus on foreclosed properties from banks). No hype, no fluff, no kidding! In addition to the “Core modules”, I also have additional “Advanced” modules that cover the nitty-gritty of advanced stages of a real estate deal, and these are also step-by-step! Access and login 24/7 - All course materials are digitized and accessible online so you can login to access the content anytime from your computer, tablet, or smartphone. Learn at your own pace where-ever you are! Real estate contracts template library: Access our entire library of real estate contracts you can use as templates. These are based on the contracts we used for actual transactions with banks, buyers, and tenants. This is meant to be an 8-week (For Core Training, additional 12-weeks for Core + Advanced Training ) program that will empower you to identify your first (or next) profitable foreclosed property, with the knowledge and know-how that will guide you from the beginning to the completion of the deal, and you will get more than 9 years worth of "in the trenches" experience gained from working on our own deals (plus lessons from the first 4 years of trying). Training content is available online and downloadable in audio (.MP3) format, slides (.PDF), and spreadsheets (.XLS). Live Q and A sessions are done through webinars (with recorded replays), and these are delivered in a convenient, and organized way, that will give you proper direction for faster learning and success. You get time and money saving step-by-step videos. I can say you get hours and hours of training videos, but I would rather focus on the value you will get out of them. I created the videos based on our own experiences and lessons learned, and I edited them all myself to keep them short, and direct to the point, while ensuring nothing important will be left out. 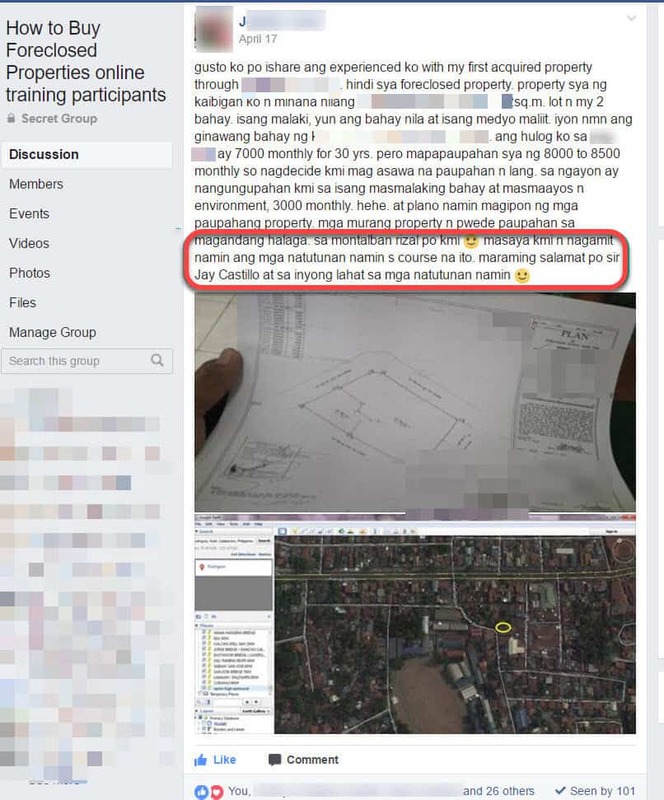 In addition to our own real estate experiences, the content for the training is also based on our interaction with thousands of people on our blog foreclosurephilippines.com where I have answered more than 4,400 questions related to foreclosed properties. 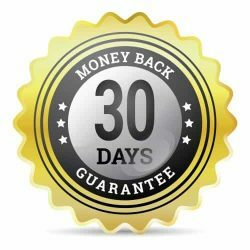 With unconditional 30-day money back guarantee! Refer to details below. I have poured out all my knowledge gained from experience, and I held nothing back in this training. It is my hope that it will empower you to get started with investing in foreclosed properties. 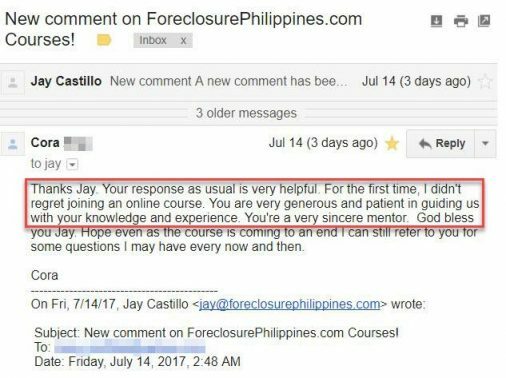 If, however, you are not happy with the training, please let me know by sending an email to support@foreclosurephilippines.com within 30 days, and I will return your money, no questions asked. Have you attended so many real estate seminars, but you've never landed a deal because something is still missing and/or you have so many questions left unanswered, and these are holding you back? When you actually tried to find a foreclosed property to invest in, you encountered problems and/or challenges that stopped you from moving forward? You actually found a foreclosed property you want to buy, but realized you don't know what to do with it? If you’re the type of person described above, then this training is not for you. Sorry. The story behind the training: How I quit my job so I can be healthy for my family, by investing in foreclosed properties! I remember way back in 2006, I ended up doing the job of 3 people in a multinational company, even if I was the I.T. Manager. I felt overworked and underpaid. So I did what I thought was the solution: I resigned, and transferred to another company for higher pay. But I was wrong, the higher pay was not the solution. This was the time when I was introduced to the book “Rich Dad Poor Dad” by Robert Kiyosaki. From the book, I learned that I was still stuck in the “rat race”! Since then, I’ve been obsessed with figuring out a way to get out of the rat-race. 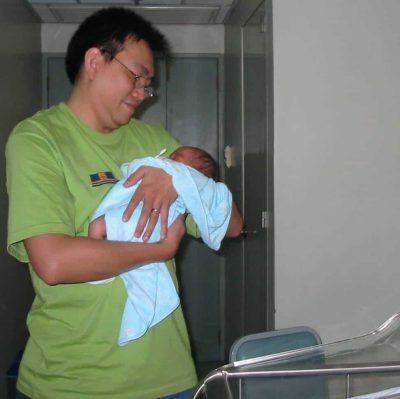 I wanted to do this, not just for me, but also for my new family. I remember I would leave for work and I would kiss my baby boy. He was still asleep. And then I would come home late at night, and he was already asleep. Enough is enough, I decided that I will get out of the rat race through real estate investing! However, I learned the hard way that I would only be able to apply what I learned from the book, if I had time to do it, if I had money to invest, and I also had to be working near where I lived, so I did not have to go far to start looking for promising real estate. So I swallowed my pride, went back to the company I worked for before, and took a pay-cut. But, I was able to start looking for real estate (for me it was foreclosed properties) during my spare time, just like what was mentioned in Rich Dad Poor Dad! Things were pretty okay, I also learned to manage my money, and I was saving for my first deal. Having a job made me feel secure again, but time passed and I had nothing to show for when it comes to real estate. It’s like I was back in my comfort zone, and I was in no rush. But one morning, that suddenly changed… when I woke up and got up, I fell down on the floor, and I saw my whole world spinning, “literally”. I vomited several times and obviously, I was seriously sick. I only managed to reach the bathroom by holding on to the walls of our house. I still wanted to go to work because I had an important meeting (crazy right!). 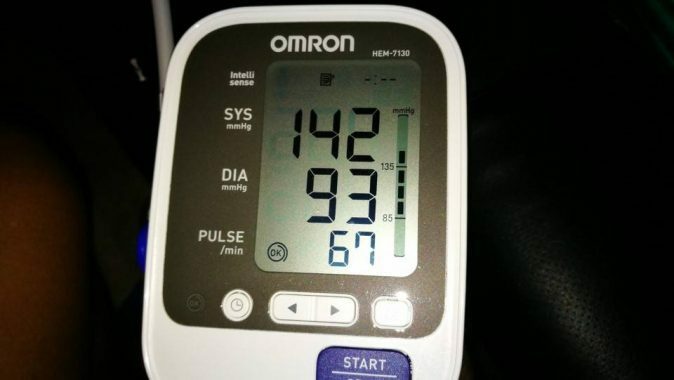 I ended up at the emergency room and was later diagnosed with high blood pressure at such a young age. While on the hospital bed, I realized how stupid I was, and I needed to stop this madness. Of course, I can’t just resign, I needed income replacement. And then I remembered real estate investing! 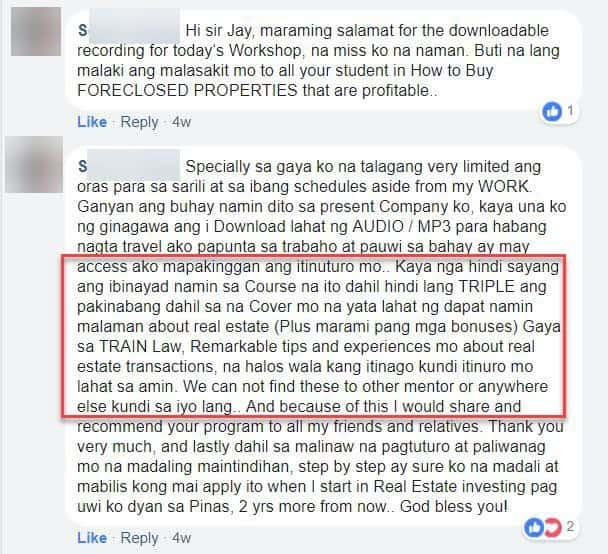 That jolt was all I needed because this forced me to really start investing in real estate, and I just had to make it work, even if I had doubts that real estate investing can be done in the Philippine setting. But that was exactly what I did. And they all turned out to be successful deals. I was finally able quit my job in January 2010! But, I really didn’t know what to do next. Sometimes I would actually go to the properties, and inspect them. Some looked okay, but most looked they badly needed repairs, but I really did not know what to do next. Later, when I checked the Manila Bulletin again, those foreclosed properties would no longer be on the list… someone had bought them already! Questions would linger in my mind like “Why did they buy those properties?”. Or, “What did they see in them that make them worth buying?”. There just had to be a way to check if buying a foreclosed property made sense. After several years of trying to figure it out all by myself, and as I was about to lose hope, I finally learned what it takes for a property to be profitable. This was through the help of friends, mentors, and the school of hard-knocks. So from not knowing what to do… I ended up buying several foreclosed properties that turned in more than enough profits that allowed me to quit my job, nice! 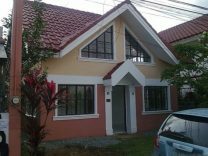 That was how I ended up creating my blog ForeclosurePhilippines.com, where I share as much as I can about our real estate investing journey. While it felt great to share as much as I can on my blog, somehow I felt that there was something missing. Have you ever felt like you had so much more to give, especially when people ask for advice? That’s exactly how I felt before when it comes to real estate, even if I was already being invited to speak on TV shows, seminars, real estate conferences, and other events. Don’t get me wrong, I always feel honored and thankful whenever I’m invited to speak about investing in foreclosed properties, just like the interview on ANC On The Money below. 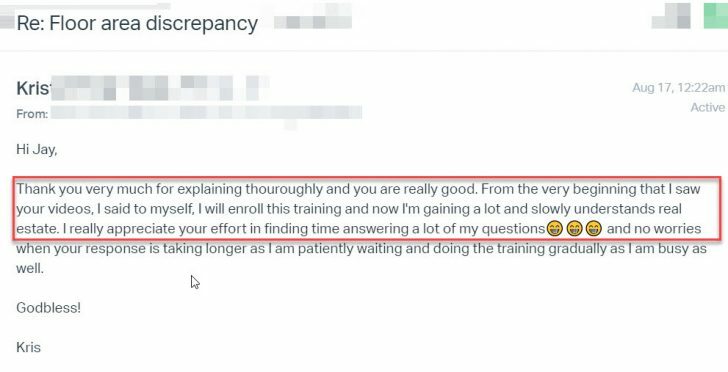 I have lost count how many times people say they want to learn more, and ask if I have my own training. At first I was hesitant to create my training because I knew how much I have to cover to give the most complete picture of investing in foreclosed properties, and this would be a huge undertaking. It would take a lot of time and effort to finish, especially since I am working on my own deals. But through the years, so many people kept asking for help, and I receive more and more questions through my blog on a daily basis… and these have added up to several thousands of questions through the years. It became very clear that I just had to create this training! I feel that it’s not right for people to rely on incomplete information out there, so after more than 4 years, I was finally able to create the first version of this training. My goal with this training is to equip you with the knowledge and wisdom gained through years of experience, so that those who go through this training can actually go out there and start investing in real estate the right way. I have held nothing back and shared just about everything we have learned through the years, and I am committed to helping you achieve your real estate investing success, through this training. You will know what worked for me so you can do the same, and you don’t have to make the same mistakes I did. What are the things that hold back people from investing in real estate, and doing it successfully? True, you need cash, but you don’t need 100% of the cash to buy a property. On the average, you only need 20% for the downpayment. Of course don’t forget that you still have to consider taxes, repair costs, holding costs, etc. On the flip-side, some people might think that they can buy real estate with nothing down. My take on this is: While some have done it, it’s difficult to do with bank foreclosed properties because banks are not that desperate to sell right now. So if you are looking for “nothing down” deals with foreclosed properties because you lack money for downpayment, then you won’t find that here. Sorry. I often attend auctions for bank foreclosed properties, and a lot of times I end up as an observer because I didn’t see any “good deals”. But, I am often surprised when a lot of properties are sold, and I even see a lot of bidders slugging it out for one property. More often than not, If I analyzed those sold properties, they turn out to be good deals. So the good deals are still out there, I just didn’t see them. Actually you don’t need to be a licensed broker, as long as you are working on properties you own. 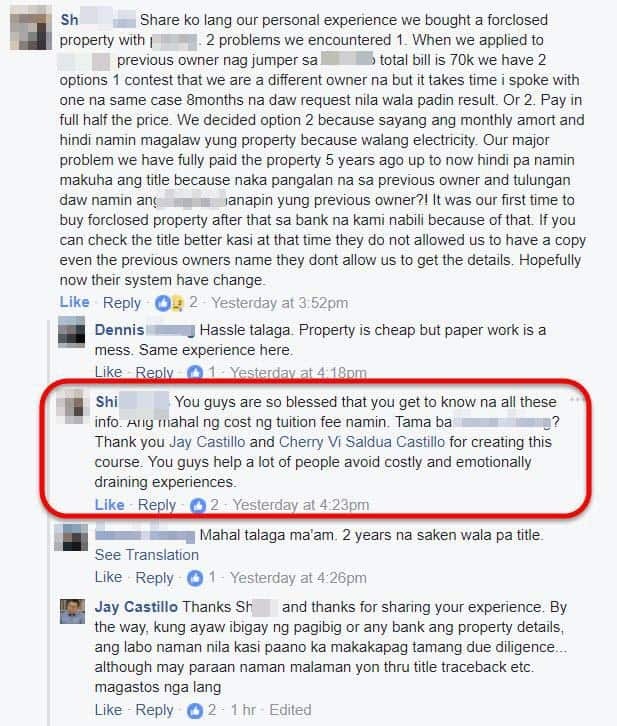 Yes, being a licensed broker an be a huge advantage, but you don’t need to be one, and this is based on the RESA law, under Sec 28(a). I also believe that you can do this without any real estate experience, that’s how I did it! If you will remember my story, I was actually working as a full-time I.T. Manager when I tried to do real estate investing on the side. And I was able to make it work. So you don’t have to do this full-time. Who will be your trainers? I am passionate with making things work, and I document what works and what doesn't so others can learn how I did it... and this is exactly what I've been doing with real estate. It is my hope that by sharing what I have learned, I will be able to help fellow real estate investors out there who are on the same journey. I am also a PRC licensed Real Estate Broker with REB License # 3194. My wife Cherry Castillo helps me when it comes to legal aspects and taxation of real estate, where she brings in here vast experience during her stay at SGV Inc.
She is a Licensed Real Estate Broker (PRC Real Estate Broker License No. 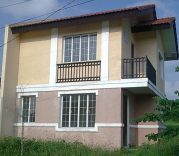 3187), and placed 4th in the March 2011 Real Estate Brokers Licensure Exam. Cherry is also a Licensed Real Estate Appraiser (PRC Real Estate Appraiser License No. 6918) and placed 8th in the August 2015 Real Estate Appraisers Licensure Exam. She's also a lawyer (Roll of Attorneys No. 55239), and CPA (PRC CPA License No. 0102054). What makes this training different from others out there? We tell it as it is. No beating around the bush, No sugar-coating. We give you just about everything. Investing in real estate is like trying to solve a big puzzle. How would you feel if pieces of the puzzle were missing? We won’t hide any pieces of the puzzle. Wouldn’t you want to get the complete picture when it comes to foreclosed properties? That’s what we want you to have with this training. Of course, having the most complete training can take a lot of time to run, and it can take days, which means it can be so expensive. I was able to solve this by coming up with an online training. Another thing you would need is to know what happens and what to expect at each stage of a real estate transaction, what are the costs involved, what are the applicable taxes, how to compute for them, what real estate contracts to use, etc. We have these covered in my training! One more thing that comes to mind is being part of a group of “like-minded” people who are also into real estate investing, cliche as that may sound. Again, this made a big difference for me when I was just starting out. So instead of trying to do it all on my own, it was so much better when my friends, fellow investors, and mentors shared feedback, tips, inputs, and information (ex. experiences with buying from a certain village, market values, etc.). This was a big help, and pointed me to the right direction. You get this in my training through our exclusive facebook group. By the way, my training is not meant to inspire you. Don’t get me wrong, it should inspire you to get started, but I go beyond that by actually showing you how I am doing it, how my friends and mentors are doing it, step-by-step. Of course, I don’t have a crystal ball, and you might have a unique situation not covered in the training. That’s what the Q and A sessions are for, so you can actually ask and get the help you need. You also get everything organized in one place, you can access 24×7, so you can go back and get the information you need down the road, whenever you need it (You get lifetime access). We hold nothing back in this training, because I want you to succeed, and I believe that’s the big difference. Note: Portions are hidden to protect the privacy of training participants. What’s the difference between the “Core” and “Advanced” modules? The “Core” modules will be shorter but still covers the entire journey you will go through when finding properties that have profit potential, and then the “Advanced” modules will cover the nitty-gritty/step-by-step/complex situations (which take a long time to explain – hence are longer). Core Training Bundle – If you simply want the essentials and quickly learn the A to Z of investing in foreclosed properties, you can take the “Core” training bundle. Of course, this option is more affordable. Core + Advanced Training Bundle – If you are concerned with the complexities you might encounter down the road, the “Advanced” modules are there for you. New modules will be added if needed, and you will have access at no additional cost… this will be like the netflix of real estate trainings, and you get this with the Core + Advanced training bundle! A map for your real estate investing adventure! At a glance, you will see what the training is all about in the following map for your real estate investing adventure. You’ll see the steps, corresponding modules/courses, and the difference between the Core training and Advanced training modules. 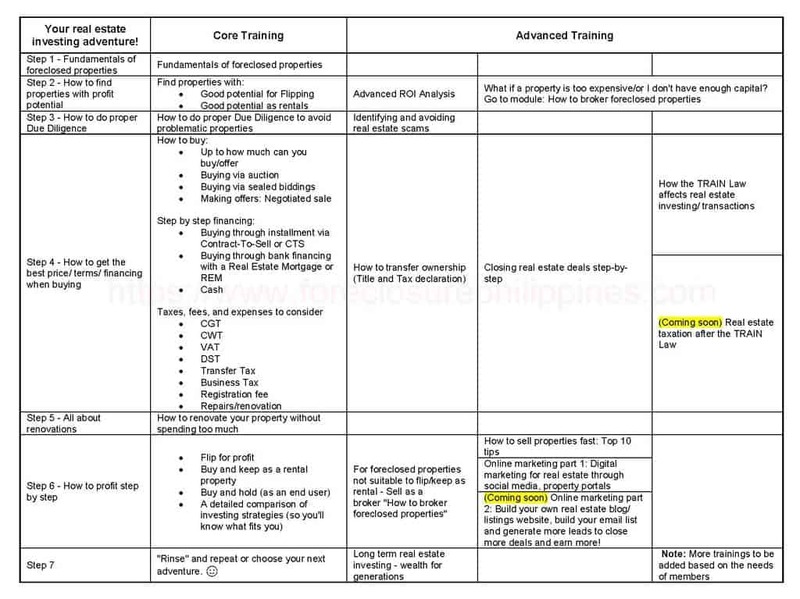 To find out what’s inside the modules above, check out the detailed training outline below. Why do most successful real estate investors invest in foreclosed properties? So you can be like them! What does a complete real estate deal look like? - Less surprises down the road! Who can legally invest in Foreclosed Properties in the Philippines? Which is better: Auctions or submitting offers? Up to how much can you offer/bid while still meeting your target ROI? Should you even renovate or not? Contractor or Foreman (etc), which is better? What will be covered in the “Advanced” modules? What Do You Need For Long Term Success In Real Estate? How about the Q and A sessions? Each workshop/ module will have Q and A sessions at the end where we answer each and every question. We will also have regular monthly Q and A sessions during “Office Hours” for the Advanced Modules which also includes “hot seat” style coaching/ mentoring sessions via online webinars. How long and how much money will it take you to try to figure this all out by yourself, do your own research, and "wing it" until it works? How much does it really cost to attend seminar after seminar that are filled with "Rah rah!" but lack the important details you need to get started? 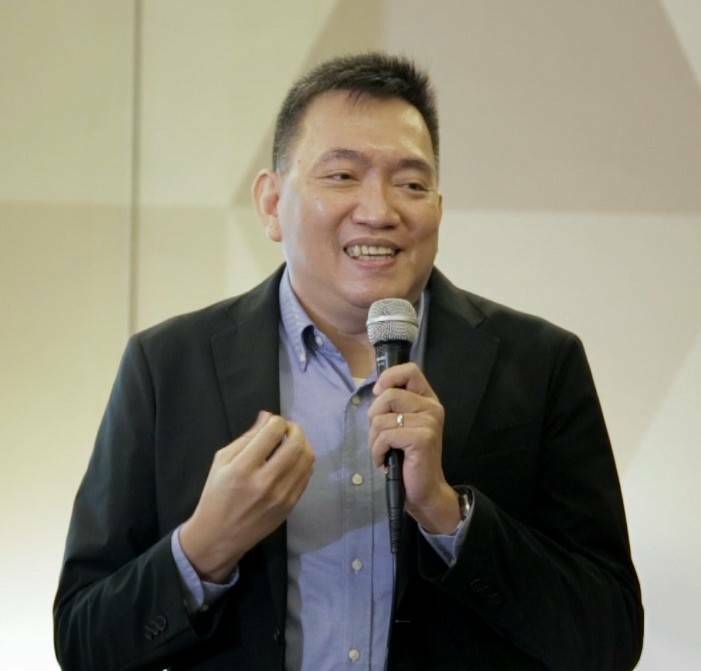 If this training saves you from losing money on a bad deal via your show money (Usually Php20,000.00 for auctions) or earnest money (about 5% to 10% of the selling price when making offers), then the training has already paid for itself! What if the training helps you to actually get started with a profitable property, and you land more deals? If you enroll, you can get the practical knowledge you need, and avoid making costly mistakes! So instead of thinking how much this training will cost, consider the value of everything that you will get if you invest in this training! And you also get these awesome bonuses! Get bonus access to our "How to invest in tax delinquent properties training". Buy 1 - Take 1 promo for your spouse/ fiancee/ partner/ sibling/ aunt / etc. Real estate investing is better done with a partner, which is why we are giving you a "Buy 1, Take 1" bonus if you enroll with your spouse, fiancee, tito/tita, sibling, etc (choose 1). You and your partner will BOTH have access to the training. What happens when you enroll via credit card? After you click any of the “ADD TO CART” buttons above, you will be sent to a secure payment page. You just have to follow the instructions on the screen. Once payment is completed, you will be logged-in automatically in the training area. Login details will also be sent via email. If you encounter any problems, please call/text me, Jay Castillo, at +639178843882, or send an email to support@foreclosurephilippines.com, or click here to submit a support request. Note: For those who will purchase this training from within the European Union, the European Union Value Added Tax (aka EU VAT) is applicable, and will be automatically applied on top of the listed price during checkout. I have poured out my knowledge gained from experience, and I held nothing back in this training. It is my hope that it will empower you to get started with investing in foreclosed properties. Note: Since its more tedious to pay via bank deposit / online transfer / remittance, I’ll give you Php497 discount compared to Full Payment via credit card. Note: For BDO online transfer, you might encounter a PHP 10,000 limit per day, and because of this, you can just make two transfers over two days to cover the whole amount. Please don’t forget to let me know through the payment details form for each transfer, through Step 2 below, so I’ll know the transfers came from you. Click For Payment Details Form! Please don’t forget to provide your deposit / remittance / transfer details through the form linked above! This helps us know exactly who sent the payment… otherwise a payment will end up as unclaimed or “unknown sender”. 3-1: Send an SMS/Text message to +639178843882 and/or call (632)585-9200 to inform us of your deposit/remittance. 3-2: Upon verification, you’ll receive an SMS/Text message and/or email confirmation that you have successfully enrolled for the “How To Buy Foreclosed Properties” online training. 3-3: I will send your login details via email. Note: Please allow 24-48 hours for us to verify your bank deposit/ remittance/ transfer. Once verified, you will receive your login details, as mentioned above. I am abroad/ in a different time-zone, I cannot attend the live webinars. Will there be a replay? Yes of course, all webinars will be recorded for everyone who will be unable to attend them live. Recordings for the live webinars are uploaded 48 hours after the workshop. Same goes for all Q and A sessions done through webinars. The recording for the “in-person”/physical workshop in Quezon City however can take longer, it depends on our videographer. In the past, it took 3-4 weeks. What is the schedule for the training? Will you be offering consultations for students who will be investing for the first time? Yes, the consultations will be done during the Q and A sessions. The Q and A sessions also serve as “Mastermind” sessions where one attendee will be on the “Hotseat” and share the challenges he/she is facing, and other attendees can give feedback, inputs, assistance. Can I join the training even if I'm not a licensed real estate broker? Yes, you can attend even if you are not a licensed real estate broker. You don’t need to be a licensed broker to invest in real estate, and I’ll show you how in the training. I don't speak/understand tagalog/filipino, Will the training be conducted in english? Yes, the training shall be conducted in english. In case attendees ask questions in tagalog/filipino, don’t worry because I will repeat in english, and I will also answer in english, which is our standard practice. In case I speak tagalog at times, I make sure to repeat in english, or speak in english first and say “In tagalog…”. 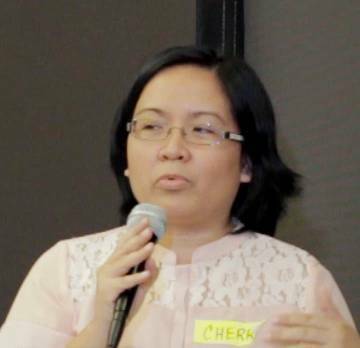 Except for the “In-person” workshop for module 6 in Quezon City, the workshops will be through an online seminar or webinar, which means you can access it online from where-ever you are, as long as you have a reliable internet connection. The venue is basically anywhere you choose, as long as your device can connect online! Will I earn CPD units in this course? At the moment, we cannot guarantee that this will qualify for CPD units as self-directed learning. Technically, it should qualify, but we have not yet tried it. Once online trainings are qualified for CPD, we will definitely work on getting this training accredited! I believe investing in real estate is just like like planting a tree, because it takes a lot of time and patience to grow and bear fruit. The sooner you start, the better. Otherwise, you might look back years from now and have regrets for not grabbing an opportunity when you had the chance. But how would you know if a foreclosed property is really a good opportunity? That’s what my training is all about. I look forward to seeing you inside the training area. 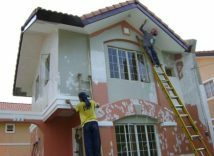 Earnings and income representations made by ForeclosurePhilippines.com, are only aspirational statements of your earning potential. 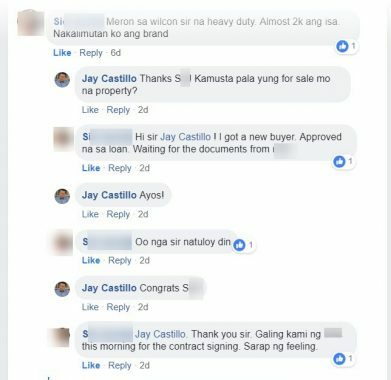 The success of Jay Castillo, and all testimonials / examples used are exceptional results not typical to the average person, and are not intended to guarantee that you or others will achieve the same results. Individual results will always vary, and yours will depend entirely on your own individual capacity, work ethic, perseverance, experience, level of motivation, diligence in applying what we teach in the training, the economy, normal and unforeseen risks of buying real estate, and other factors.